Sight-fishing: do it once, and it becomes a life-long obsession. 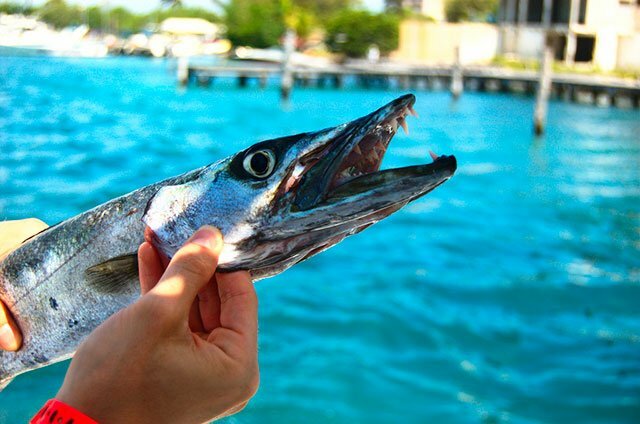 The excitement of getting a fish to take a well chosen, properly cast fly is palpable, and if you want to crank up the excitement level a notch (or two), then sight-fishing for barracuda will easily fulfill that requirement. They’re there. Waiting. The takes are electric, landing one is a blast and each leap is both beautiful to watch as well as a stern warning that the fish is about to leave you empty-handed, bewildered. Barracuda come with their very own, built-in set of challenges: they’re nasty, at times fickle and often just plain incomprehensible. Sight fishing for ‘cuda means one thing above all else: stalking. And fortunately these fish are the perfect blend of cautious and confident, so you can wade in real close, if you have enough patience. The barracuda certainly do. I visited John U. Lloyd Beach State Park on a recent visit to South-East Florida, the park features a one-and-a-half-mile long, bayside canal, usually teeming with small sharks, spotted puffers, nervous baitfish, lazy rays and small-to-midsize barracuda. Mornings are a bit of a mystery in that ‘cuda behavior is erratic and inconsistent at best, leading you to wonder what you’re doing wrong. Wading pace too quick? Fly selection off base? Lining issues? In late afternoons, with optimal tide conditions, however, their curiosity seems almost heroic (dusk is the best time because their razor sharp vision puts them at a predatory advantage). During this all-too-brief period of the day, they patiently wait for you to wade way up close to get a good bearing on their position—right before darting off at 40MPH. Conclusion #1: wade slowly, prudently,and stop short just a little sooner than you think you ought to. The benefit of this cannot be overstated: you’ll have a fish to cast to, as well as a perfect sense of where to place that fly. Mangroves are another issue to contend with. I’ve lost more fish than I care to admit due to disastrous mangrove tangles. Let’s face it, when in shallow water, is there a better place for a fish to seek refuge than under thick mangrove cover? Conclusion #2: avoid mangroves. This is done by patiently coaxing the fish as far as possible from their preferred cover before finally laying the fly down for a potential strike: this normally requires 2 to 3 casts that are immediately stripped from the surface, 7 – 8 feet directly ahead of them normally does the trick. On the final cast, let the fly sink just below the surface, then retrieve. Don’t be afraid to get creative when stripping line in—slow, fast, long, short, they all work, depending on what mood the fish are in. The goal here is to give yourself the best chance of playing the fish in open water—or at least as ‘open’ as waters generally get in narrow canals. I’ve read on numerous occasions that ‘you can’t strip in the fly fast enough’, which can be true, but not on all occasions. Conclusion #3: vary your retrieve if the current strategy isn’t a winner. While tides are good indicators, barracuda sometimes turn up when least expected, leading me to wonder if temperature readings outweigh tidal info when searching them out. As for the best temperature range, this is still very open to discussion (drop me an email if you think you’ve figured this one out). 25 to 50 foot casts are the rule (works out nicely if you’re a novice fly caster). On the reel: Because canals are relatively tight quarters, there’s no real need for tons of backing. 100 yards is sufficient. Off the reel: 10-foot, 10lb. saltwater leader which has been trimmed down to a respectable 8’ ending with a size .022 tippet; this helps immensely with fly turnover. 8-lb. leaders are great to use when using the shortest bite-guards and the smallest possible flies—for when you’re tracking smaller ‘cudas – which are just as fun to play as the big guys when using light gear (6- or 7-weight rigs). Over time, I’ve run into quite a few ‘cuda aficcionados, and one of the eternal questions when targeting these fish is: what size bite guard? Unless you’re a masochist, mono won’t do, period. Wire is the way to go: 4” to 6” is my usual starting point, then I wait for the day to progress before I size down one inch at a time—down to minimum of 3”—which may sound like gambling, but canals generally aren’t world-record ‘cuda territory (yes, I have lost some larger fish, but that number is negligible). To date, there’s no such thing as a barracuda fly line (RIO, Scientific Anglers et al, take a hint), however, I found that the Scientific Anglers redfish taper doubles nicely for this purpose. The mid-weight head and aggressive front taper deliver every possible fly selection without strain—and unless there are wind issues, it’s not even necessary to overpower your cast. As for overall technique, I repeat: wade cautiously, wade slowly, shuffle—don’t stomp. This cannot be overstated. Every tip listed above means nothing if you’ve inadvertently scared off everything with fins. Final note regarding gear: you know about rods, lines and flies, just be sure not to forget those long-nose pliers. For obvious reasons, they come in extremely handy when extracting flies. You’re all set—grab your 6-, 7- or 8-weight fly rod, get out there and prepare to have some serious fun.